The inca trail is an amazing experience. A lot of stunning views, beautiful ruins, a large variety of flora were the ingredients of this adventure. When my friends and I were looking online to make an Inca Trail reservations, we came across your company. 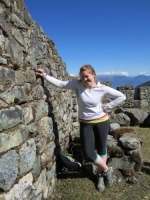 Your website does a good job describing the 4 day Inca Trail experience. The only thing that I´d recommend for the website is a section describing the porter/guide tip; we did not know the proper amount of soles to give. 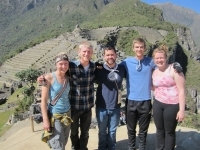 It´s hard to believe that we hiked the entire Inca Trial, but my friends and I did! With Ruben (Poncho) leading the trek, and Ronald following to make sure there were no stray hikers, we took on the challenge of the 49 kilometers. The Salkantay Trek was an amazing experience; one that I will take with me for the rest of my life. The first thing you need to know about this trek is that it is an extremely demanding trek. You will need lots of warm clothes and will definitely need to acclimatize to the high altitude. an amazing hike to Machu Picchu! what could have been a great experience became a SUPER one thanks to Ramiro management and great team of porters specially Mr. Christopher who surprised us with his fantastic cooking. All the porters were more than accommodating and went beyond their way to provide your need. Walking the Inca Trail was the trip of a lifetime. I am not the fittest person but it was a goal I set myself and was determined to achieve. El Camino Inca was a once in a lifetime experience. 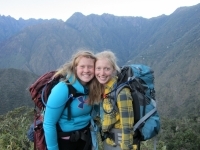 The guides were helpful and knew alot of information about the Incas and the area. They also helped me to practice my Spanish. We had a great group of people and spent the evenings playing frisbee or card games. Emphasis was placed on the group staying together.